_Folding knives are my favorite to make. They present many challenges - from the initial design to the creation of each small part to final assembly. The parts all have to fit together flawlessly to insure that the knife opens and closes smoothly and that the spring lines up properly in all positions. And it has to look right and feel good in your hand. I almost always do some decorative file work and carving on the spine of the blades. It provides a sure grip for the thumb and just as importantly, it's nice to look at! For handles, almost always Yucatecan tropical hardwoods and horns. Guillermo Piste, a woodturner in the nearby pueblo of Dzitya, supplies me with small logs of Guayacan, Ziracote and Granadillo. I'll cut these on a "bias" to reveal the most beautiful grain. I am able to get Red Deer Antler from a ranch in Tzucacab. I recently found a source for Water Buffalo Horn in Campeche. Bull Horn comes from the Plaza del Toros in Merida or Motul. 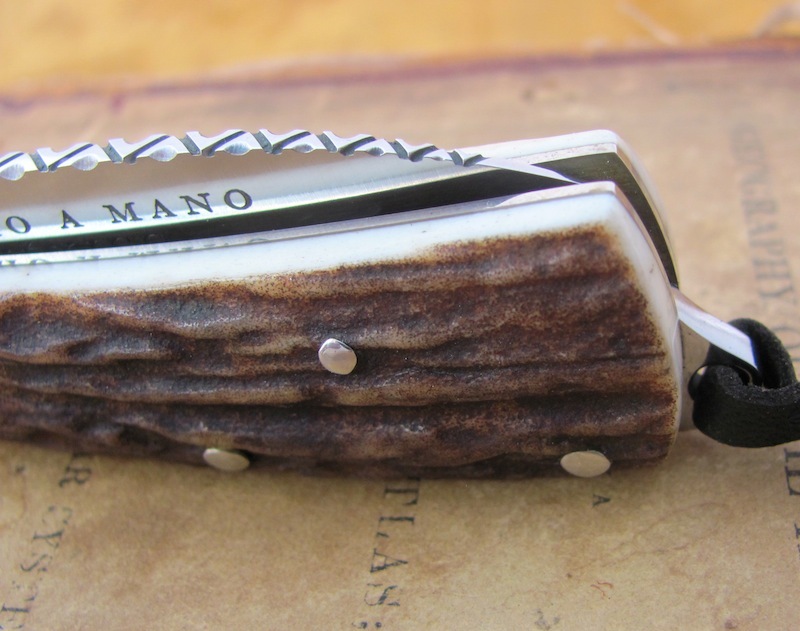 Each folding knife has a silver escutcheon made from old silver coins pinned on the handle. There is a fair in Santa Lucia park every Sunday morning where i can buy silver ten and twenty-centavos from the 1920's and 30's. I hammer them down, shape and polish them, and pin them to the handle with nickel silver pins. If you'd like, I can engrave your initials on it. I carry a pocket knife every day. You will too. 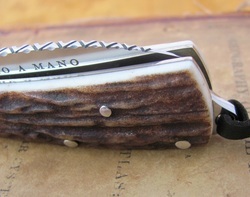 I can also etch initials, a name or a design on the blade, whether it's for you, or for a gift. Please see the "Available Knives" pages for photos and descriptions of Folding Knives in stock.